Two years ago, my incredible friend Loose Baker (who you might remember from our Being Light retreat) asked me if I would like to take part in her latest creation, The Spiritual Playground. 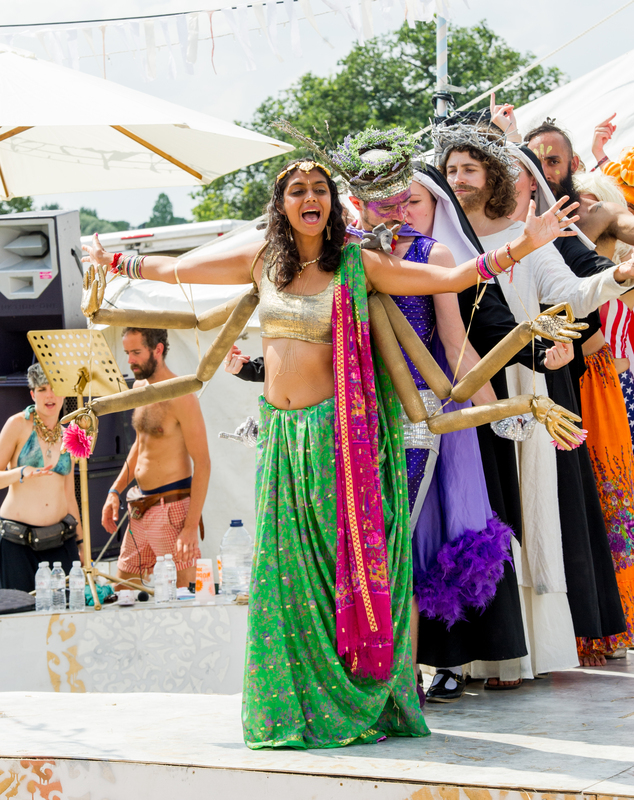 It was to be a new stage at Secret Garden Party, bringing together the sacred and the profane. I said yes, but with some apprehension and joined the line up as the Goddess Lakshmi, the Indian goddess of love, abundance and beauty. 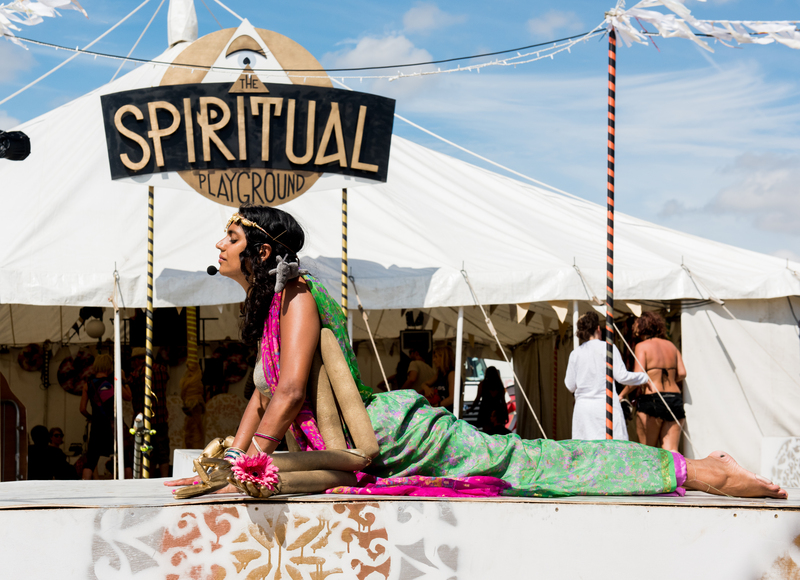 The Spiritual Playground is an interactive space led by Shesus, with a troupe of deities and belief systems including two Sisters, Merlin-Ji the mixed race medicine man, Buddha, The American Dream, Hanuman, Captain Lavender, Glutan the antichrist, Father Christmas, Yoni and Lingham. Over the days we dance, we laugh, we pray. We chant beyonce mantras at Praise Be to Bey, marry people through our weddings, and party at sunset with Shesus is a DJ. Words can’t explain it. You have to experience it for yourself. Being part of The Spiritual Playground has been one of the most personally challenging and incredible things I have done. 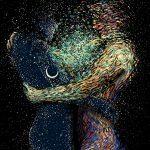 Coming at it, not as a performer but as a yoga teacher with a deep connection to the Hindu Goddesses, it was an inner challenge to learn how to invite in the divine play and not take it all so seriously. Making this shift for The Spiritual Playground has taught me how to bring this lightness, humour, and humility to everything I do. With Lakshmi, everything is welcome, and our wholeness becomes our power, the unseen magic behind everything we do. Sharing yoga through myth and the deities is one of my favourite ways to teach, and is a big part of my retreats and workshops. At The Spiritual Playground, I teach morning yoga classes, themed on Lakshmi dressed as the Goddess and I am now teaching as Lakshmi at festivals and events around the world. All those arms make a very good hug! 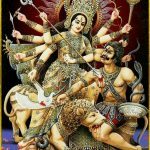 I have recorded the story of Lakshmi, with the mantra – Om Shrim Maha Lakshmiyai Swaha, which you can download and listen to. And there is also a 90 mins asana class that you can do at home with me. All you have to do to access it is go my gifts page, and follow the instructions. plus you will find a bunch of other meditations, myths and mantras there. 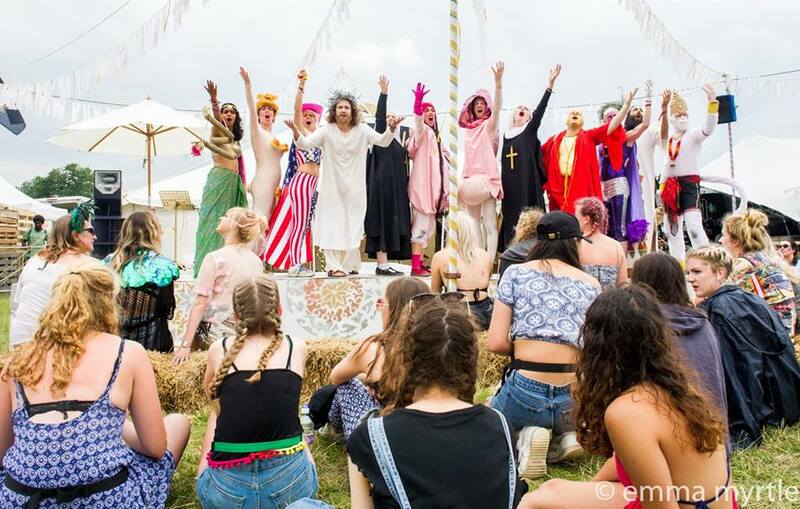 This year is the last Secret Garden Party (as we know it), so who knows what will happen to The Spiritual Playground after this… If you this genuine opportunity of enLIGHTenment, come and join us. You can follow us on facebook, and look out for theatre shows from Shesus and the Sisters. 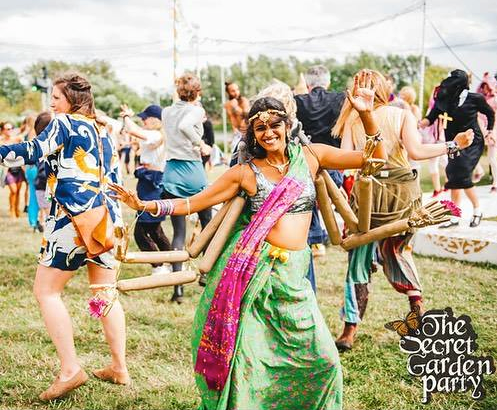 Photography by Emma Myrtle, apart from official Secret Garden Party photo by Justine Trickett.